Harmful algae blooms (HABs) involving Prymnesium parvum (Golden algae) is a worldwide fish killing event, seriously threatening the aquaculture industry and aquatic ecosystems. HABs frequently occur in natural reservoirs such as natural lakes which receive large numbers of visitors throughout the year. As a result, large amounts of Ultra-Violet (UV) chemical filters (the active ingredient of sunscreen products) are released to the lake due to swimming or sun-bathing, which add synergic environmental stresses on the Lake ecosystem. 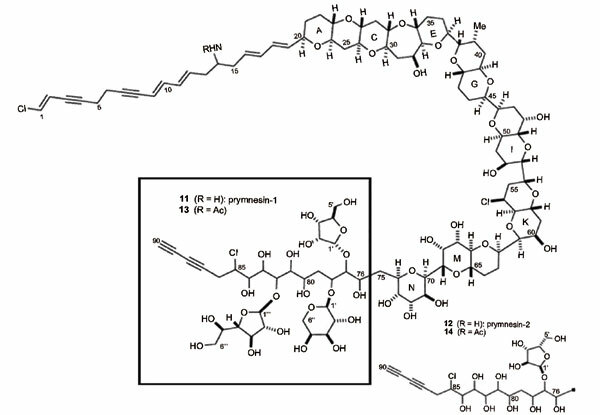 Prymnesium parvum is associated with the production of potent toxins (prymnesins) known for fish kills around the world. The molecular structure of prymnesins possesses both chlorine and nitrogen groups which can actively participate in photochemical reactions with organic and inorganic UV filter molecules. Consequently, reactive oxygen species (ROS) and chlorinated toxins can be potentially formed, leading to fish kill and dangerous biomagnification of reactive molecules in humans through dietary consumption of seafood. In this brief review, we discussed some possible mechanisms for the formation of toxic compounds due to the presence of UV filters and chlorine-containing compounds, using a lake in central Texas as an example. While the properties of various biotoxins released by P. parvum in a HAB event have been investigated, this is the first time that the environmental concern of the toxic behavior of reactive UV filters in a HAB event has been highlighted. Significant new insights are needed for the connections between harmful algae blooms and the accumulation of UV filters in water bodies so that appropriate policies can be established to protect the marine environment. Prymnesium parvum, algae bloom event, UV filters, prymnesins, photochemical interactions, multi-enlormated Prymnesins.